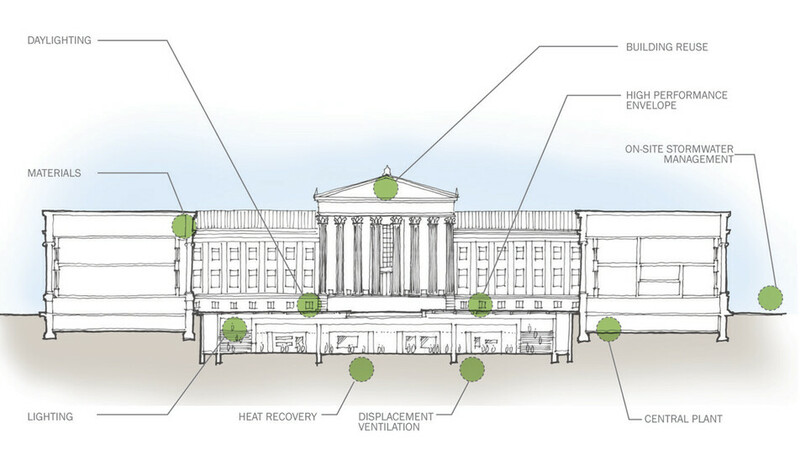 Atelier Ten’s largest institutional renovation project in the U.S. to date, the museum’s ten-year, multi-phase renovation presents myriad challenges for energy targets and benchmarking. In response to Philadelphia’s Local Action Plan for Climate Change, the city’s stormwater management guidance plan, and Architecture 2030, Atelier Ten wrote sustainability guidelines for Phase I of this complex expansion. The guidelines address energy efficiency, stormwater management, and sustainable materials. Phase 2 includes renovations to the existing building and the addition of new space that will take place over 10 to 15 years in phases so the museum may continue to operate during construction. Atelier Ten is guiding the implementation and achievement of the sustainability guidelines through environmental design and energy analysis while also tracking the LEED process through each phase of construction.